The photo on the right is of an Earli Grande peach tree and was taken in the middle of May. This tree was planted bare rooted about a year and a half earlier in January. Being located on the East side of the house, at a distance of about twelve feet, the tree receives late afternoon shade. The peaches are medium to large in size and are semi-freestone with an excellent flavor and texture. Flowers on an Earli Grande are pink. Peaches are relatively easy to grow in the lower desert if a variety well adapted to the hot arid climate is chosen. The best two varieties for the Phoenix area are Earli Grande and Florida Prince. They can take full sun, but it is recommended to give them afternoon shade the first summer. Cold weather is not a problem because peaches are deciduous. Peaches can of course be eaten fresh, and are also great for salads and pies. Unfortunately, peaches do not keep very long once picked and the whole crop becomes ripe on the tree within several weeks. Plan to refrigerate part of your crop immediately after picking. Peaches can also be frozen for later use. The key to successfully growing peaches in the lower desert is choosing the right variety. Peaches need a certain number of chilling hours, time below 45 degrees Fahrenheit, to produce fruit and stay healthy. 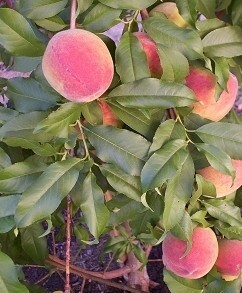 The majority of peach varieties will not produce in Phoenix because there is not enough cold in winter. Luckily, there are a few varieties that do very well. The best varieties are Earli Grande and Florida prince. Desert Gold and Bonanza will also produce here but their fruits are smaller and their flavors are not as good. Peaches can take full sun once they are established but are happier with some afternoon shade. Afternoon shade is recommended for the first year after planting. Peach trees are deciduous and can take temperatures well below freezing. It is best to plant bare rooted trees while they are dormant in January. Trees in a pot should be planted in late fall so that they have sufficient time to grow roots before summer. It is better not to plant the tree in the grass. However, if you do so, dig out a large circle of grass around the planting hole to keep the grass from competing with the tree. The hole for the tree should be at least twice the size of the rootball. At a minimum, make the hole 2 feet in diameter and 2 feet deep. Back fill the whole with the same native soil that was removed. It also is a good idea to finish with the hole an inch or two recessed so that a watering basin is formed. After planting, spread a thin layer of compost on top of the soil to help conserve moisture and to supply some nutrients. Do not fertilize the newly planted tree until it has been vigorously growing for a couple of months. Bare rooted trees should be tied to a solid stake for support. Potted tries might also need to be staked depending on their dimensions. Peach trees do well on a grass watering schedule year round. Although, they can handle getting even less water in the winter than a grass schedule provides because they are dormant. Basin or flood irrigation is recommended because it helps keep the salt in our salty water from accumulating around the roots. Furthermore, deep watering will encourage the plant to develop deeper roots, making the plant tougher when the weather gets hot and dry. Do not fertilize the tree the first year. This will encourage its roots to go looking for food. After the first year, lightly fertilize the tree with a balanced chemical or organic fertilizer, below its drip line, once in early February, before bud break, and again in early June, after fruiting is complete. Peach trees are fast growing and should be pruned during the winter. Peaches emerge on new growth, so if the tree is not pruned the peaches will emerge further away from the trunk every year, eventually putting heavy strain on branches, potentially breaking them. Furthermore, a peach tree can get very big so pruning will keep it a manageable size. On mature trees, it is recommended to remove 2/3 of new growth every winter from the previous summer. This can be done by a combination of heading back branches and removing branches. Always remove any branches coming from below the graft point or from the roots because these branches are coming from the rootstock and will not produce good fruit. Only a grafted tree will produce fruit identical to that of its parent. Birds can get all of the peaches unless measures are taken to discourage them. Hanging old computer or music cd's to the tree is very effective. The dancing relections from the shiny side of the disks spook the birds.